Episode titles: Within, Without, Redrum, Patience, Roadrunners, Invocation, Via Negativa, Per Manum, Surekill, Salvage, The Gift, Badlaa, Medusa, This Is Not Happening, DeadAlive, Vienen, Empedocles, Three Words, Alone, Essence, Existence. Deleted scenes with optional commentary by Frank Spotnitz and John Shiban. Special effects sequences with commentary by Paul Rabwin. 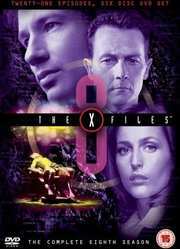 Character profiles on Alex Krycek, Gibson Praise, and John Doggett.